The Illinois lease agreements for residential and commercial property are between a landlord and tenant for the use of space in exchange for the payment of rent. The tenant should first view the space and, if interested, should request to submit their credit and background details through the rental application. Once the landlord has reviewed their credentials and the individual(s) are approved the negotiations over rent, security deposits, and any other terms should be negotiated. Once a rental contract has been created and signed by both lessor and lessee it becomes a legal document with each party being bound by its terms. Rental Application – Used by the landlord to screen any potential lessee. Commercial Lease Agreement – For a landlord-tenant relationship over the use of business-oriented space such as office, industrial, or retail related. Lease Agreement (with Option to Purchase) – Contract used for a typical rental arrangement with the added course of action to purchase the residence. Month to Month Rental Agreement – A tenancy at will, or, a document that binds a landlord and tenant but there is no end date and either party may cancel by using the termination letter with at least thirty (30) days’ notice. Roommate (Room Rental) Agreement – A contract amongst persons living in a home that is shared with each individual having a bedroom to themselves. Standard Residential Lease (Chicago Only) – Fixed term, usually one (1) year, for the use anywhere within the City limits. Standard Residential Lease (Outside Chicago) – Fixed term, typically twelve (12) months, that is to be written for any residential unit outside Chicago. Sublease Agreement – Allows a tenant to re-rent their space with the landlord’s permission. Tenant may not have the subtenant stay longer than their master lease. 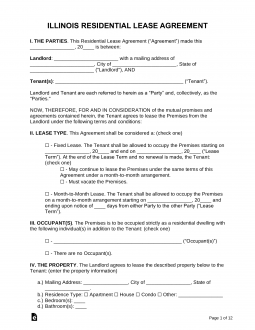 Termination Lease Letter (735 ILCS 5) – Landlord or tenant needs to give the other party at least thirty (30) days’ notice before canceling a tenancy at will arrangement. Concession Granted (765 ILCS 730) – Any type of concession for rent is required to be mentioned in the lease. When entered into the page the header with the words “Concession Granted” should be in at least one-half (1/2) inches in height on the document. Failure on behalf of the landlord to write this, if there is a concession, is considered a misdemeanor in the State of Illinois. Lead Based Paint – Any residence constructed prior to 1978 is required to have this addendum attached to any agreement to inform the tenant(s) of this hazard. Radon (420 ILCS 46) – Landlord is not required to test for radon. Although, if the Landlord finds out that radon exists on the premises that they must relay the information to the tenant. This does not qualify for residences on the third (3rd) floor or higher in a building. Shared Meter (765 ILCS 740/5) – If a tenant is required to pay a portion of a master utility the landlord must share the formula used to calculate the tenant’s responsibility. The State of Illinois does not require landlords to give notice to a tenant before entering their property for any non-emergency reason. Although it is recommended that all landlords notify their lessee’s before entering the premises. Maximum – No State cap. Returning (765 ILCS 710) – The Landlord has 30 days to release the Security Deposit to the Tenant(s). If there are deductions to the deposit then the Landlord must list and send the deductions to the Tenant(s) within 30 days and release the remaining Security Deposit amount within 15 days thereafter (45 days total). Interest (765 ILCS 715) – If the Landlord owns more than twenty-five (25) rental units they will be forced to place the Security Deposit in an interest-bearing account to be at least the interest rate in the State of Illinois on the previous December 31 of the most recent year.